Recently on our Facebook page we discussed our favorite kisses in Hitchcock's films, and so here we have the Hitchcock Kiss, with a nod to Joel Gunz whose recent posts on hit Alfred Hitchcock Geek blog have pointed to the influence of sculptor Augusts Rodin on Hitchcock's work. Well worth your time to check out! Thirty-one years go yesterday, Alfred Hitchcock passed away. I do not think he would be at all surprised to know that the mark he left on cinema and on pop culture continues and shows no signs of waning. Earlier this week I made a return appearance on The Radio Dan Show where regular guest Joel Gunz (you know him as Alfred Hitchcock Geek), host Dan Delgado, and the "super-hot" intern-extraordinaire (she likes me to call her that) Jessica Pac talk about all-things-Hitchcock in a segment of the show each Monday. You can listen in or view a video of the show here (the Hitchcock segment starts at about the 38 minute mark). Joseph Stefano, screenwriter of Psycho and the first writer engaged to write Marnie. This week I was going to talk about some of the Hitchcock collaborators and associates I've encountered in my work. I'd planned to talk about Ernie Lehman, Evan Hunter, Doc Erickson, Henry Bumstead, Joseph Stefano, Herbert Coleman, and others. But as usual the clock wound down far too quickly and I only got to speak about the last two. Both of which I feel made significant contributions to Writing with Hitchcock —one because it was just part of his generous nature, and the other in spite of himself, as he admitted to a reluctance to provide me with anything worthwhile, and possibly had an ulterior motive in providing what he did. 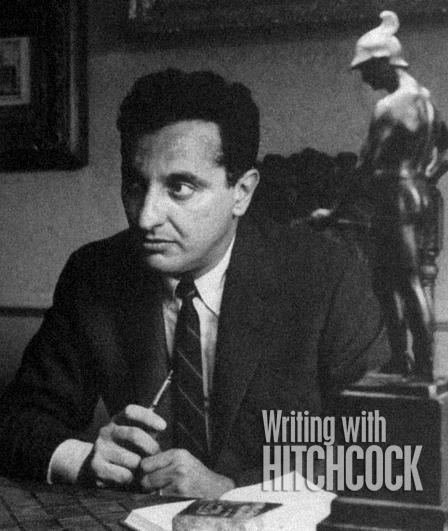 Of course the former is Joseph Stefano, the screenwriter of Psycho , who I had the pleasure of meeting for the first time at NYU's Hitchcock Centennial Conference in 1999. To re-cap the story I told on Dan's show, I first saw Joe at the panel discussion of Hitchcock's screenwriters, which also included Evan Hunter and Arthur Laurents (unavailable at the time of this session, Jay Presson Allen had a one-on-one later in the conference). I had tried to get John Michael Hayes to be a part of this panel, but his vision had made travel difficult and he declined, saying that he'd be well represented by my presence and presentation. The discussion was entertaining and informative, but for the most part did not break much new ground for me. What was apparent though was that Joe was the most enthusiastic and unpretentious of the bunch. He engaged with the audience and seemed genuinely interested in the others' experiences with Hitch. On a personal level, I was impressed. On another morning of the conference I was to present my work on Hayes's collaboration with Hitchcock. Right before the session began, way at the back I noticed Joseph Stefano and his wife Marilyn enter. I thought, "Wow, this is so cool of him. He's not just here to tell his own stories, toot his own horn, and revel in adulation." Joe was a true lover of film. He loved talking about it, doing it, engaging with new people who were also interested in it. Then when I saw he was making his way down to two empty seats right in the front row it occurred to me, here I was about to give a presentation of what it was like being a screenwriter for Hitchcock, when one of his screenwriters was sitting not more than ten feet from me! "With diamond clarity, Steven DeRosa defines the art, the joy, the rewards—and the hazards—of screenwriting for a cinematic genius like Alfred Hitchcock."